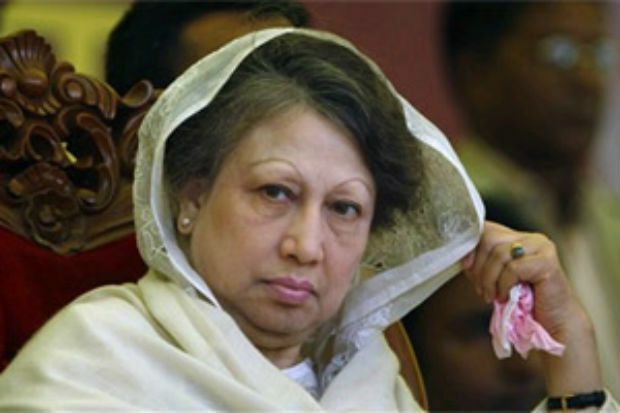 A Bangladesh court on Wednesday issued an arrest warrant for opposition leader Khaleda Zia over a fire-bomb attack on a bus that killed two people and injured dozens last year, a prosecutor said. “She is the main accused in the case,” prosecutor Shah Alam Talukdar told AFP. It is not the first time that Zia ─ the bitter political rival of Prime Minister Sheikh Hasina ─ has faced arrest, and BNP spokesman Ruhul Kabir Rizvi dismissed the charge as “laughable”. “This is politically motivated and is part of deep conspiracy against her,” he said. The attack took place during a nationwide blockade last year of roads, rail and waterways which the 70-year-old Zia called to try to force Hasina to resign and pave the way for new elections. The blockade unleashed a wave of deadly violence, leaving more than 120 people dead as opposition activists fire-bombed hundreds of buses and trucks and police responded by firing live rounds. Around 15,000 opposition supporters and dozens of BNP senior officials have been arrested as part of a crackdown by Hasina in the wake of the unrest. A judge in the Dhaka Metropolitan Sessions Court issued the warrant against Zia after accepting a police charge-sheet over the attack in Dhaka on January 10, 2015. However, it was not immediately clear whether police would act on the order. Another arrest warrant issued against Zia last year was never executed. Either way, the order is another blow to the two-times former premier, who has described previous cases against her as politically motivated and aimed at keeping her out of politics. Police said up to 200 BNP activists and supporters staged a protest in front of the party headquarters in Dhaka as news of the court’s move emerged. “They shouted slogans and staged an impromptu demonstration. But they moved back to the party office before police reached the spot,” assistant commissioner of Dhaka Metropolitan Police Saifur Rahman told AFP. The BNP’s second-in-command, Fakhrul Islam Alamgir, was arrested Wednesday on separate charges related to the 2015 unrest. He was held in jail before being granted bail on health grounds. The party was further weakened by the crackdown last year, when police pressed charges against thousands of their leaders and grassroots activists over the fire-bombing campaign. The party has recently been trying to stage a comeback, holding a leadership election this month after more than six years. It wants to introduce fresh faces into the leadership.